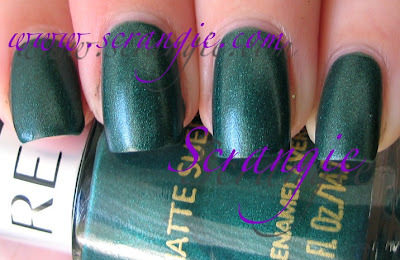 Revlon Matte Suede in Emerald City. Nothing very matte or particularly suede about this. It's a nice color, a blue toned green shimmer, but I don't care for the finish. If it didn't say it was matte on the bottle, you probably wouldn't even know it was matte finish. It's one of the shiniest mattes I've ever seen. Takes a long time to dry, too. Looks pretty nice with topcoat, though. Brings out a faded, dusty look to the green. If I can get up the energy soon I have those awesome new Nicoles I wanted to post, plus the new Winter Nubar collection showed up last night and I have a whole lot of other fun colors that I need to be coherent to post.... And, by the way, Red Bull does not give you wings, it gives you heartburn. I really don't like the finish of this one, but it's very pretty with top coat. I agree about Red Bull! :O And the polish. This is so pretty! I haven't got anything like this yet! I've been pretty disappointed by the "drugstore" brand "mattes". Good thing I have ChG matte top coat. Sorry you are feeling blah . I passed by this one, and I agree with you. The colour is pretty, but it isn't very matte or unique either. I did get the matte white from the collection, so I am looking forward to trying that one. The first post on this polish which has made it look appealing! Red Bull is the caca! The following is NOT a paid presentation! LOL. Truly, for an energy boost with no crash? Try those little 5 hour energy drink things. They only taste a little better than RB, but they're also small enough to hold your nose and toss back in one gulp. My friend owns a small business and when staffing issues force her to work multiple 16 hour shifts in row, she swears by those things. Me, I'll stick to Diet Coke. I think you might have gotten an off bottle since mine is extremely matte. I just bought the four Revlon Mattes. This is my favorite. It isn't at all a matte or suede but I still love the shade. Admittedly this is the first matte polish I have tried. But it's really matte for me, like Christina said.